Apple is providing daily updates on Olympic-related content from a variety of respected sources. Current news includes a report on the games' winter weather from Time, a feature on the high-tech gear Olympians will be wearing from the Smithsonian, a report on America's biggest and most diverse team ever by the Washington Post, a look at the venues built for the Winter Olympics by Curbed, a feature for visitors to the games by The New York Times, a profile of what athletes will be eating by ABC News, and figures including how many condoms Olympians will be distributed by organizers--among other record setting facts by CNN. 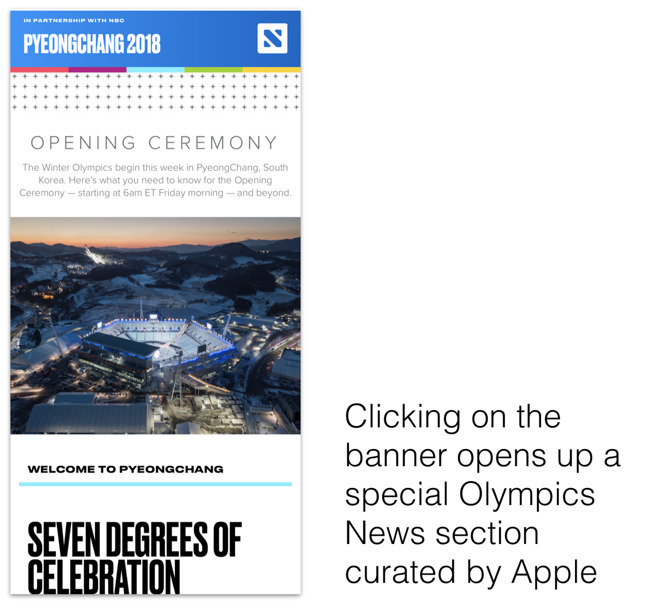 Along with providing curated links to various news sources, the News app also presents infographics created by Apple News team itself, and daily briefings of updates to keep enthusiasts up to date on the Olympic events in South Korea. 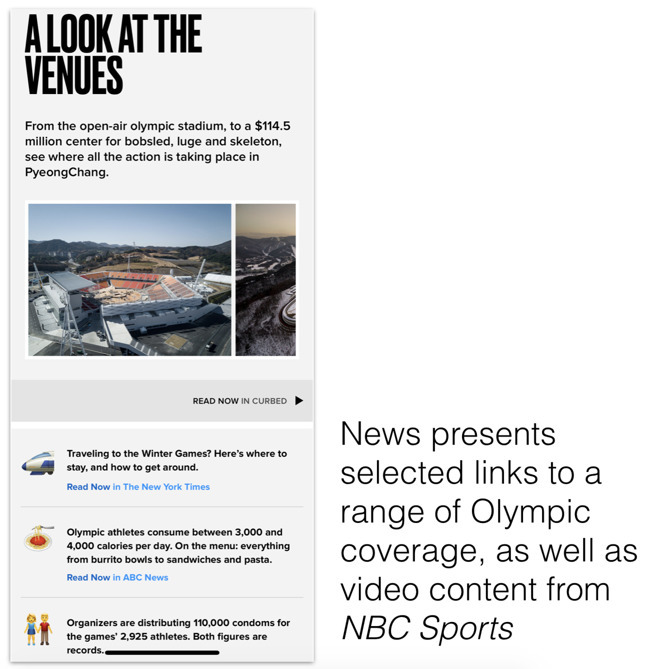 The new Winter Olympics section in News also provides calendar scheduling features, enabling iPhone and iPad users to select scheduled competitions and add the events to their Calendar, complete with links that open in the NBC Sports app for watching. The partnership with NBC will present clips directly in News, with links that open the NBC Sports app to stream live events and replays. The News app also presents real-time metal tracking for winners of the Olympic Gold, Silver and Bronze, including a widget that presents a counter of team's progress, just a swipe away from the Home screen. Note that Apple's News app is currently only available to users in the U.S., U.K. and Australia. If you change your iOS device's regional settings to another country, the News app will disappear, even if your App Store account is set to a supported country. 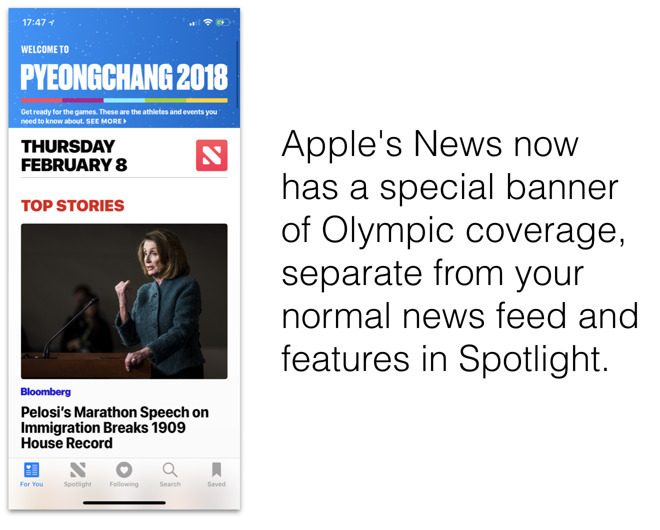 Apple's new efforts to provide value-added curation in the News app for the Winter Olympics parallels the "Spotlight" tab it recently added to News to provide a daily set of news and features updates hand-picked by Apple's News team, rather than just a series of aggregated news headlines. Last spring, Apple hired New York Magazine editor Lauren Kern to serve as the 'editor in chief' of its News app, part of an effort to develop a full news curation team driving valuable, reliable content that is uniquely available to iOS users. The move toward more human curation in News follows a revamp of the iOS App Store, which similarly shifted from a basic catalog of titles by subject to a series of app features and developer profiles designed to focus on the store's best content in a format that feels more like a magazine than a simple software market. Apple has similarly worked to present human curation in Music, profiling musicians and presenting features, documentaries and human-curated playlists, along with Connect profiles users can follow to keep tabs on their favorite musicians and performers. The kind of curation Apple is working to provide in its various apps stands in stark contrast to the simple paid placement, advertising-oriented aggregation of Google, YouTube, Facebook, Instagram and similar apps that are primarily seeking to scrape existing, free or user-generated content and then stuff it with as many paid messages as possible, while tracking what users "like" or respond to in an effort to focus how they monetize their users. By using machine algorithms or crowd-sourced "likes" and retweets to drive what content goes viral in the faces of their users, Google and Facebook have created cesspools of horrific content including violent and exploitive messages focused at children; given a louder new voice to proponents of extremist hate speech; and erased journalistic standards and scientific review and replaced them with fake news willfully generated not to inform but rather to inflame or distract.